Escarole and Beans | What's Cooking at the Genua's? Such a delicious hearty peasant dish. Love it on a cold fall day or anytime for that matter. It’s a cross between a soup and a stew. You can even add some cooked ditalini macaroni to this if you want to stretch it. Any small pasta will do. If I wasn’t so lazy I’d run out to the store right now and buy some escarole and make this tonight. Maybe tomorrow night. This is such an easy dish to make and so good for you as well. Escarole is overlooked at times, people are afraid of it. It is actually part of the endive family but is less bitter. With the right spices and sauce it is just heavenly. Mangia! 1. Saute the garlic and onion in the olive oil in a saucepan until translucent. Add the escarole, carrot and broth, bring to a boil. Once it boils simmer for 20 minutes. 2. Add the beans but do not stir them in. Cook for another 5 minutes. Stir gently to mix, then serve with grated cheese and if you like, a nice hot loaf of crusty Italian bread. 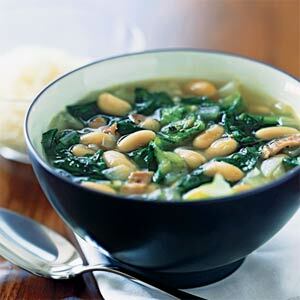 One of the restaurants that we order from for lunch at work makes escarole bean soup. Theirs is good, but very oily. I will have to try this one out!! Came across your web site via google the other day and absolutely adore it. Keep up this fantastic work.